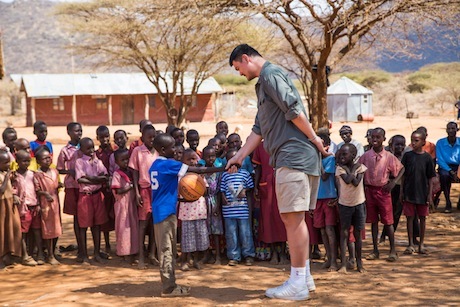 Last week you might have seen this post we had of Yao in Africa. Since then, he has been keeping very busy bringing attention to the terrible slaughter of elephants and rhinoceros in Africa for their tusks, many of which are used to create ivory jewelry bought by Chinese. 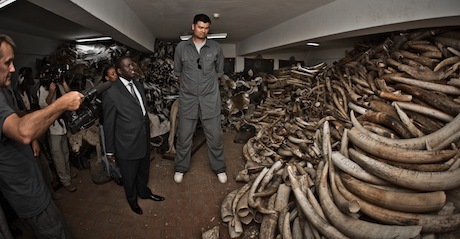 Below is a striking photo of Yao in an “ivory room” of confiscated tusks, showing how bad the problem is. And these are just the tusks that were confiscated. 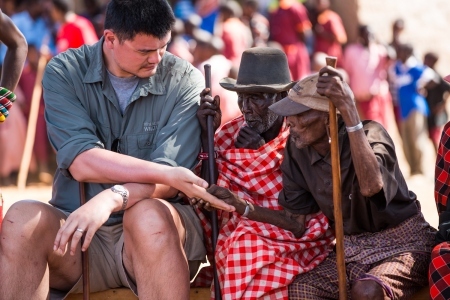 Below, Yao meets a village elder in the village of Samburu. What an amazing shot. …and here he meets some children on a dirt basketball court. There are so many photos and stories on a special blog that WildAid has setup for Yao, I couldn’t possibly cover it all here. But I suggest you check it out as Yao brings more attention to Chinese citizens about the damage being done to Africa’s wildlife — more than any other Chinese citizen could do. By the way, Yao’s trip is getting attention even among the U.S. press, as seen by this coverage in Yahoo! Sports’ basketball blog. 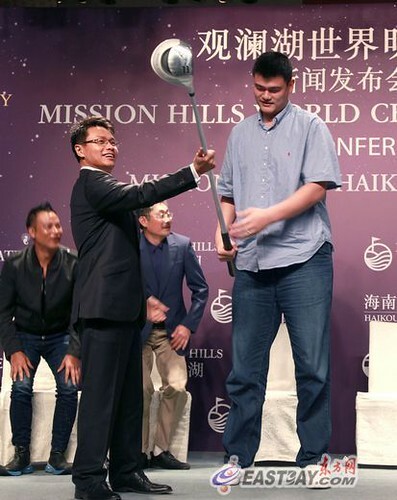 Talk about Yao transcending the sport of basketball! 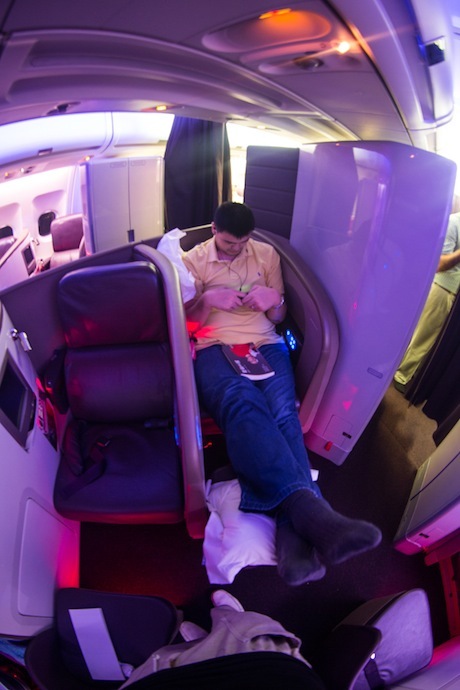 After Yao left the London Olympics a few days ago, he took a Virgin Atlantic flight to Africa where he has been filming a documentary for WildAid to help save endangered species. 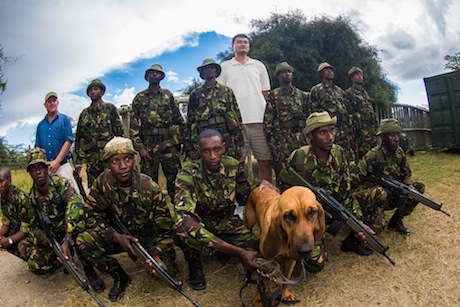 Below, Yao is with armed guards in Kenya who do rhino patrolling at the Ol Pejeta Conservancy, home to Kenya’s highest concentration of wildlife. The guards know each and every rhino by name and sight, and if they can’t find one during their daily patrol, then they use a plane to patrol the entire conservancy until all rhinos are accounted for. 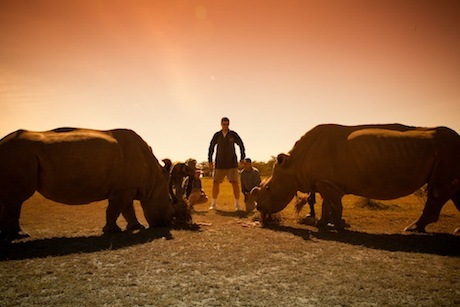 Pictured below, Yao meets two of the rhinos. But protecting rhinos from illegal poaching is time consuming and expensive. That’s one of the reasons why Yao has made the trip, and is blogging for WildAid here where you can see many more photos and personal blog entries from his trip. 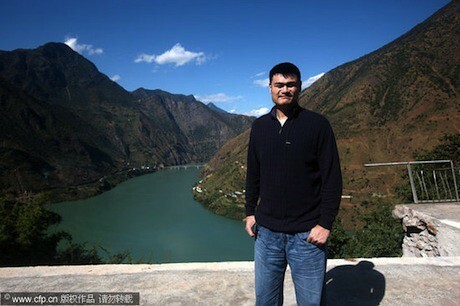 You can also see Raymond’s coverage of Yao’s trip starting here in the YaoMania forum. About 8 days ago Yao Ming and his wife Ye Li attended “Artistry on Ice” featuring some of the world’s top figure skaters at the Shanghai Oriental Sports Center. Sitting with them were the TV-movie star couple Deng Chao and Sun Li. Click here for more photos of Yao at the “Artistry on Ice” event. After the show, Yao and Ye Li met with Jeffey Buttle and Joannie Rochette, Olympic medalists and World Champions from Canada. Look how small they look! 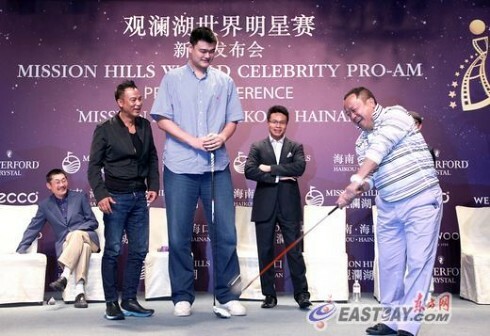 On June 20th, Yao appeared in a press conference to announce he will be part of Celebrity Pro-Am golf tournament in October at the Mission Hills golf course in Haikou of Hainan Island. Yao will be the Charity Ambassador for the 2nd bi-annual tournament, which will benefit the Yao Ming Foundation and the United Nations Children’s Fund (UNICEF). The tournament was first staged in 2010 and has already become one of the region`s leading lifestyle and entertainment events. At the press conference, Yao said he has become addicted to golf. 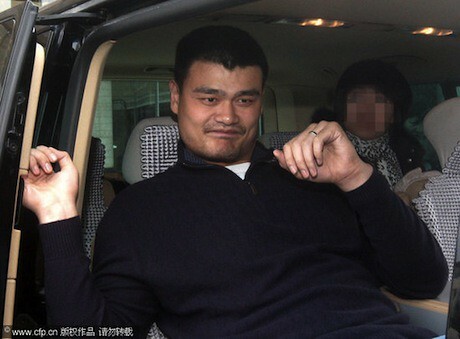 Yao also said he hopes golf will help him keep fit since he has been struggling to control his weight since retirement. “If golf proves useful in weight control, I will persist with it,” he said. This year’s 2012 Mission Hills World Celebrity Pro-Am, like the inaugural one, will feature many famous professionals, celebrities and movie stars from China, Hong Kong, Taiwan and the world. Joining Yao will be Brazilian football superstar Ronaldo, Chinese gymnast and international businessman Li Ning, former world number one snooker player Stephen Hendry and past Masters champion Ian Woosnam. Celebrities include famous film directors Feng Xiaogang and He Ping, film actors Wang Zhiwen, Chen Tao-ming, Zhang Guoli, Sun Nan, Leon Lai, Coco Lee, Charlie Young, Simon Yam and Michelle Chen. More celebrities will be announced later. The professional golfers who will play will compete for a prize purse of $1 million. Click here for more photos and information from the press conference. Yao Ming and Liu Xiang appeared at the opening ceremony of the inaugural Shanghai Municipal amateur public competition on June 10. The purpose of the competition is to raise awareness on the importance of physical fitness, so the Shanghai Municipal Sports Bureau will organize Shanghai’s inaugural amateur public sports competition for all Shanghai residents, as well as tourists and ex-pats working and living in Shanghai to participate. The event will last for 5 months, starting June 10th all the way through November 17, and apart from basketball, football, volleyball, table tennis, badminton, and swimming competitions, it will feature a range of demonstrations, from body-building to more traditional Chinese sports such as martial arts. Around June 6th, Yao Ming’s Shanghai MAXXIS Sharks officially called off a trip to The Philippines for so-called “goodwill games” amidst a tense Chinese-Filipino territorial dispute. 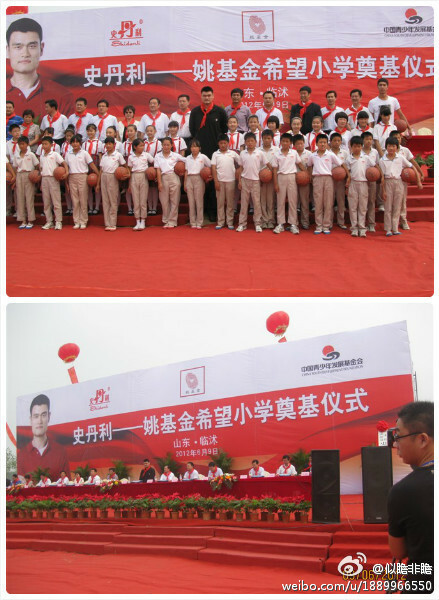 On June 9th, Yao Ming went to Linshu of Shandong to donate RMB 1.5M for the 14th Yao Foundation Project Hope Primary School. Yao took a late evening flight to fly Qingdao from Shanghai on June 8, and had to travel by car for 3 to 4 hours to arrive in Linshu. This will be the very first Yao Foundation Project Hope Primary School in East China. The first thirteen Yao Foundation Project Hope primary schools were in the Southwest provinces of Sichuan, Yunnan, Guizhou and Qinghai. The RMB 1.5 million will be used to refurbish and build new school complex and facilities at an old school, the Taoyuan Elementary School founded in 1985. The Taoyuan Elementary School currently has six classes, 350 students, and 16 teachers. After the refurbishment and expansion, it is expected the new school will be able to educate more than 700 students, and will become much larger with new sports facilities and equipment. 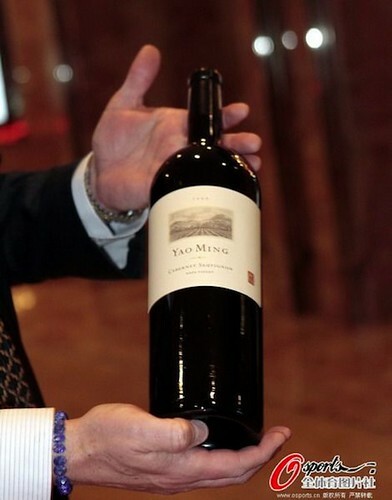 Yao Ming’s 2009 Napa Valley Cabernet Sauvignon won a silver medal at the world’s most authoritative and prestigious Decanter World Wine Awards in London. The Decanter World Wine Awards is the world’s leading wine competition. The competition is well known for its rigorous judging process, which has led to the Decanter World Wine Awards becoming the most trusted and prestigious source of wine recommendations for wine lovers worldwide. This year, over 200 judges from around the world assessed 14,119 wines from 47 countries, the largest entry ever for the Decanter World Wine Awards. The judging panel consisted of wine merchants, sommeliers, journalists and authors, including 54 Masters of Wine and 11 Master Sommeliers. The 2012 Decanter World Wine Awards were announced on May 22, 2012 at The London International Wine Fair. 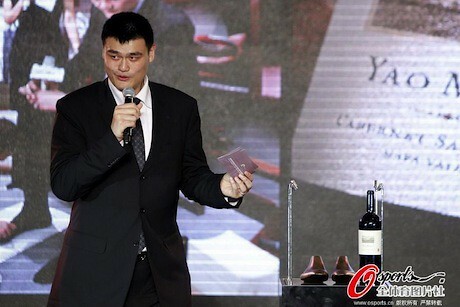 Even after retiring from basketball 10 months ago, Yao Ming still gets rock star attention in China. On Friday in Beijing, Yao showed up at a university, and many of the students there skipped their classes and followed him around, taking photos and posting them on their microblogs. Yao visited the China Youth University for Political Sciences in Beijing to announce his Foundation’s launch of the inaugural Project Hope Primary School Basketball League season. This will be the first ever nationwide basketball league for 47 Project Hope primary schools (including the 6 Yao Foundation Project Hope Primary Schools that the Yao Foundation had built in the past 4 years, with 7 more in various construction/refurbishment stage). In his speech, Yao said he wished through this project that it will provide — through basketball — that poor kids in some of the backward cities and provinces can participate and get new opportunities for growth and development. Click here for more photos and information from the announcement. Friday also happened to be the 10th anniversary of Yao’s Shanghai Sharks winning the China Basketball Association championship in a game where Yao scored 44 points on 21-of-21 shooting from the floor, grabbed 21 rebounds, and blocked 7 shots. 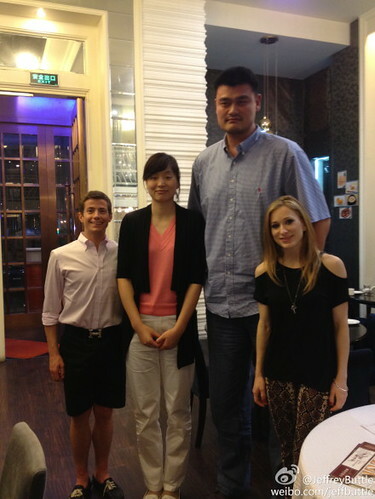 No wonder Yao is still so admired in China. Yao Ming, his wife Ye Li, and the Princess of Monaco visited a special needs school in Shanghai on Monday. 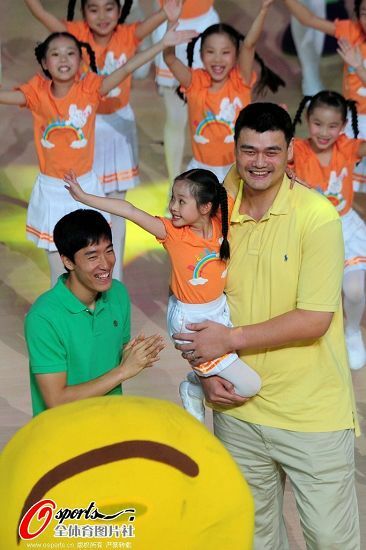 Both the Princess and Yao Ming are global ambassadors of the Special Olympics. The Princess, Charlene Wittstock, married Prince Albert of Monaco last July. She was formerly a South African Olympic swimmer. 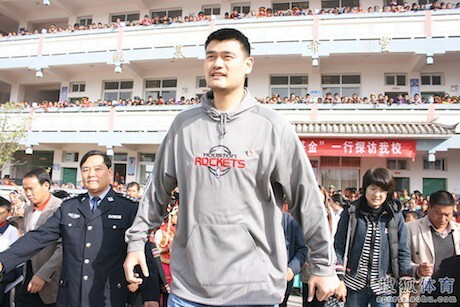 Click here for more photos and an article on Yao and the Princess’ visit to the school. 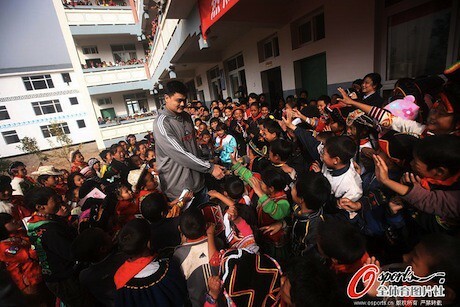 We take a break from all the “Linsanity” to let you know that Yao, as busy as he is, still took the time on Friday to go to Leshan of Sichuan to checkout a school that will be refurbished by the Yao’s Foundation and Anta, the Chinese athletic sports apparel company. A new school complex will also be built. 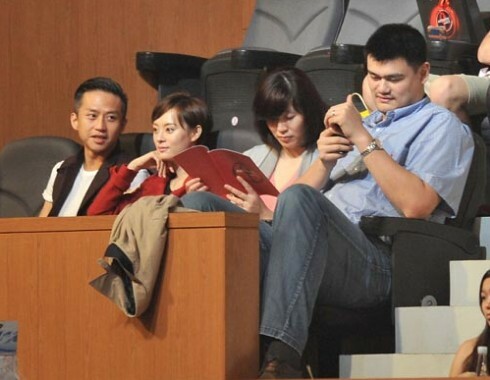 Yao Ming’s wife Ye Li also attended the visit. 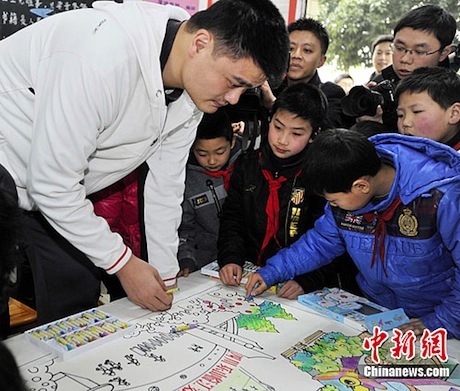 Pictured below is Yao with school children drawing a picture of the new school with crayons. For more photos of their visit, click here. Raymond reports in the forum that a few days ago Yao flew from Shanghai to the scenic tourist city of Lijiang in the Yunnan province, then took a 4-5 hour car ride to Ninglang county to visit one of the primary schools built by his foundation. The ride was fairly bumpy, and the Volkswagen van he rode in was too small such that every hour or so, the car would have to pull over and stop so Yao could stretch his legs. During one part of the trip, the road was blocked for repair and maintenance, so Yao got out of the van to negotiate with the workers to allow the car to drive through. 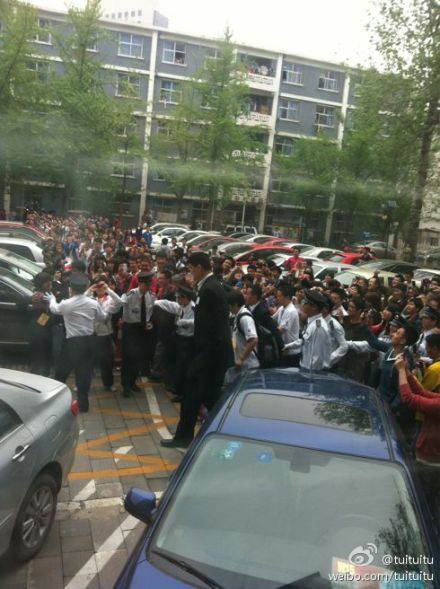 Once Yao arrived at the school, he was greeted by a large throng of students and faculty. This is the 7th school that has been built by the Yao Foundation, with six more scheduled to be built. 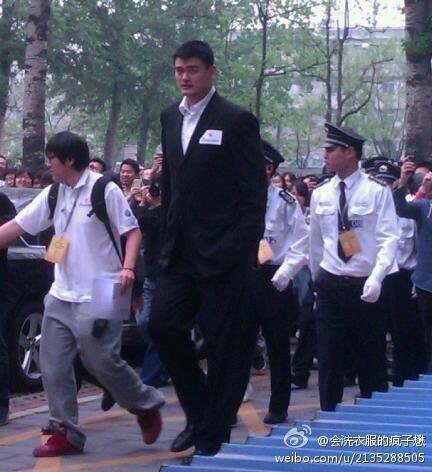 Click here for more photos of Yao at the school.